Batchelors Way: Rustic Charm Room - It is all in the Details! Rustic Charm Room - It is all in the Details! 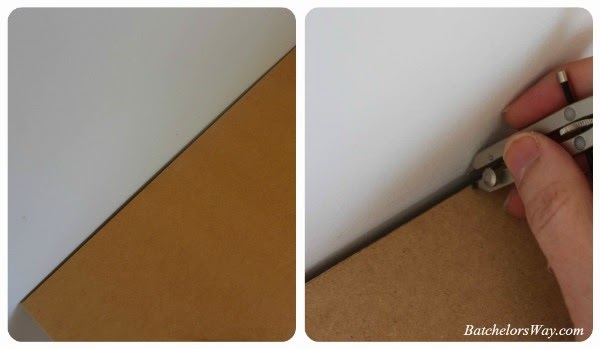 The big key to making modge podge built ins work, is in the details. Making all the little things make them look like they were built that way. For example I planned a head for the crown moulding, I haven't installed it but I left room for it at the top. Lots of times you will have to solve how to fill a gap or make a connection of two pieces so that they look like it was meant to built that way. A good example is the corner of our office built ins. We had a weird gap to fill. You can go here to see how we solved that problem. My point is to give some thought to the details, 'cause they can make or break your finished product. I have a couple of details to show you today that I did on Ashlee's built ins. First up I decided to make her counter tops and window seat tops out of 3/4 inch MDF. I cut them to fit and then scribed them to the wall for a good fit. I have really struggled with how to scribe things, so this time I decided to figure it out once and for all! Yeah turns out it's super easy. But just in case an of you out there are struggling like me let me explain. We all know walls are not square, especially the corners due to the dry wall mud being furred out. Anyways when you place a square item up against a wall you will see an uneven gap. It gets bigger and smaller. You can caulk gaps but big gaps full of caulk will get dirty and eventually look ugly. Begin by pushing your counter into place, and find the widest part of the gap. Using a compass set it to the width of the widest part of the gap. Once your compass is set just run it along the wall. It will mark a line on your counter. Take the counter out and sand up to the line. When you put it back into place it will fit so much more snug!!! OK now to the real detail dilemma I had. The book shelf I used, the free one we cut in half back here, well it had rounded corners at the top. Remember we cut it in half and mounted each half to the wall. So now one side had rounded corners and one square. To make matters worse you could see the curve from the side as well as the front. This meant I couldn't just put new trim on the front with out the side looking weird. Trust me, I tried that first! Then I pulled the trim off and decided to try again. I think I tried a couple more ideas and pulled them off as well! I finally decided to make the front face frame over hang the side, and put a matching piece of trim along the bottom on the side. That looked pretty good, but we were looking for VERY good!! So I added a second piece of decorative trim to finish it off. (I had picked up this trim one time at the Restore. Les had ask, "What's that for?" Anyway, I think that trim really made it look more professional. So that's my crazy tip for the day!! I guess I will leave you with a picture of how the built ins look. It's time to start prepping for paint!! totally confused by the scribe process. Perhaps you could do a tutorial on it some day? 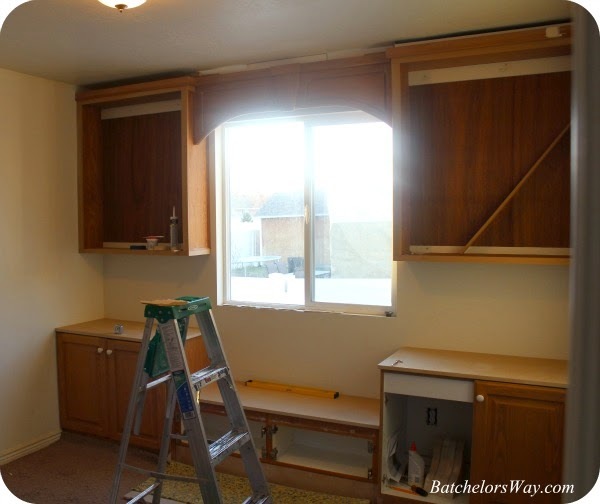 Also confused by the trim dilemma, and how you "fixed" it, but I'll maybe understand in the next post on this room. You are so inspiring and amazing!